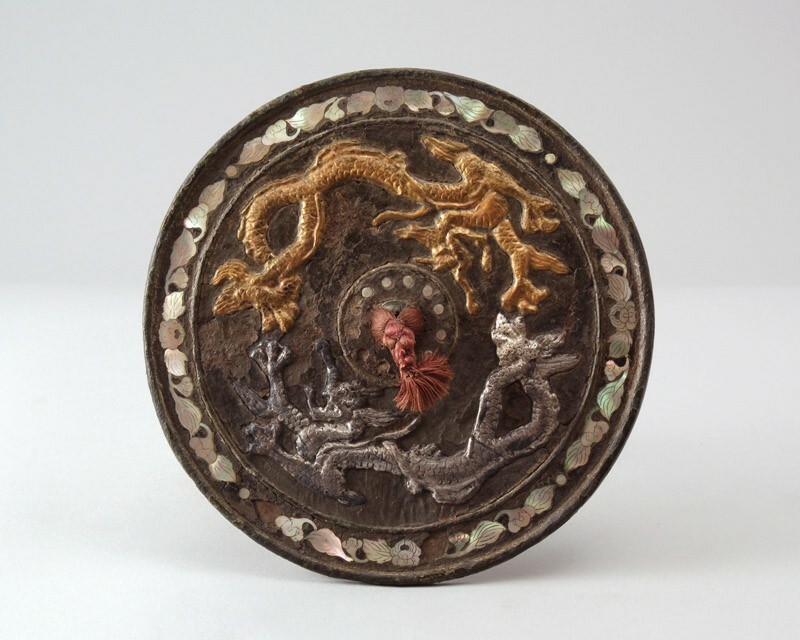 The flat circular mirror has a pierced boss on the back, now fitted with a silk tassel, raised on a circular field and surrounded by two dragons in relief. The dragons are depicted with long snouts, flowing manes and scaly bodies with hooked spine, pursuing each other and emitting flames. The surface was covered with black lacquer, now largely degraded, which was inlaid in mother-of-pearl with small circular pieces around the boss, and flowering pomegranate around the rim, with four sections separated by small dots. The shell shows incised details and is mostly preserved. The reflecting side of the mirror now partly covered by green patina. The two dragons have in modern times been overpainted in gold and silver, respectively.